And they shall mourn for Him as one mourneth for his only son. – Zechariah 12:10. Now the soldiers took off the scarlet mock-robe from Jesus, and put His own raiment on Him, and led Him away to crucify Him. 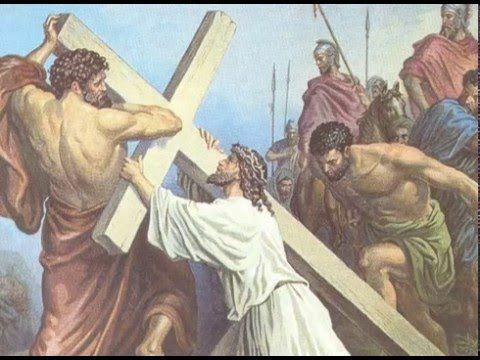 And He carried His cross, until the Roman soldiers concluded that He needed help with the burden. They met a man coming out of the country, Simon, of Cyrene in Africa, the father of Alexander and Rufus, who must have been well-known among the Christians at the time St. Mark wrote his Gospel. The soldiers compelled this Simon to bear the cross after Jesus. And there followed Him a great multitude of the people, and of women who bewailed and lamented Him. Thus Jesus foretold the great and terrible doom that was to come upon the Jewish people, the dry tree, because it rejected the Savior, the green branch. And He desired not tears of human pity, but tears of true contrition, namely, tears that reveal sincere sorrow and regret over one’s sins. Following such tears of contrition, the Lord desires to work saving faith through the promises of mercy and forgiveness in the Gospel.If such promises are received in the heart of an individual by faith, then there will also be a God-pleasing sorrow and mourning for Jesus on account of what He suffered. God grant unto us the Spirit of grace and of prayer so to view and so to mourn Jesus. PRAYER. – Alas my Lord and Savior, of myself I am in no way sufficient or able to meditate properly and beneficially upon Thy holy Passion. Therefore I pray Thee to have mercy upon me, and to give me the Spirit of grace and of prayer that I may know that Thou didst suffer because of my sin, to redeem me therefrom, and to make me righteous before God and eternally blessed, to the end that I may be truly grieved by my sin, and thank Thee with a joyful heart for having so graciously saved me. Amen. Here the troubled peace, may find.